Daily desk refill displays two-page-per-day spreads printed with yellow and blue ink on white paper. Each spread offers a full weekend, half-hourly appointment times from 7 AM to 5 PM, Julian dates, and past, current and future months reference blocks. QuickNotes section offers a place for notes, priorities and to-dos. Dated daily refill offers one tab per month that easily snaps in. 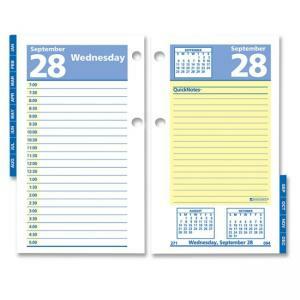 Calendar refill fits all standard 17-style bases and is made with 30 percent post-consumer material. 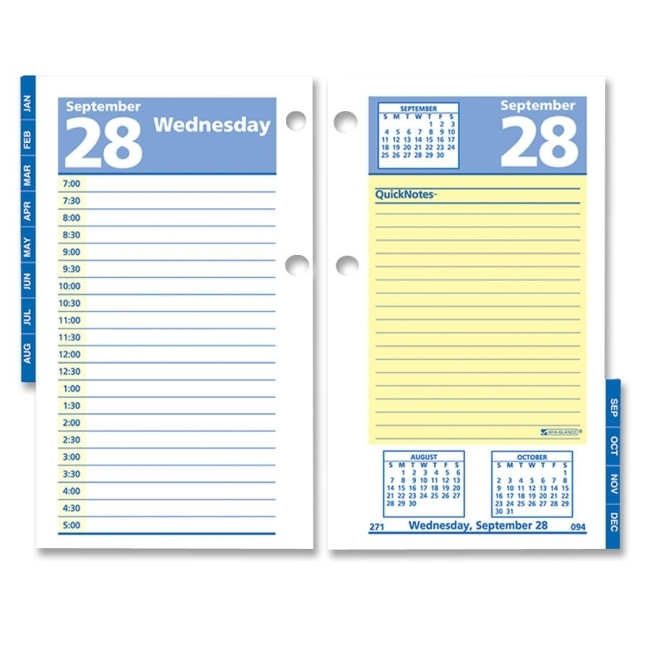 Media Size: 3.50" x 6"
$33Franklin Covey Compact Planner Refill - 4.25" x 6.75"
$32Day-Timer Daily Planner Refill - 8.50" x 11"
$28Day-Timer Planner Refill - 5.50" x 8.50"